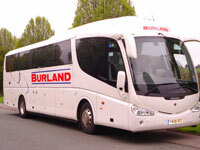 Burland Coaches are pleased to announce the arrival of their executive coach. This has a toilet, air conditioning, drinks facilities, and has the corporate image that today's travellers always enjoy. Judith at Burland Coaches welcomes any customer to view the coach at any convenient time; just phone to ensure the coach is available. 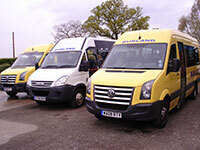 Please ring Nantwich Tourist Information on 01270 303150 for Burland Coach booking excursions. Please also note that we continue to run a polite, professional personal service to serve our many customers; and with reliability and reasonable prices, stay competitive with new untried and tested coach firms trying to edge in on the excursion market. Thank You. Nantwich Tourist Board approached Burland Coaches to work together in order to provide day excursions to various parts of our beautiful country. The partnership has worked extremely well with many popular trips to all parts of Great Britain, supported by locals from all surrounding districts.